Top 5 Breakfast in Bed Ideas to treat your loved one! Breakfast in bed is one of life's real pleasures and as it's something that most of us don't get to enjoy very often, what's rare is always beautiful! Mmmmm. Yummy. This brekkie requires a little bit of work when it comes to making the Hollandaise sauce and of course, poaching the eggs. But breakfast in bed is supposed to be a luxurious, decadent, once in a blue moon experience so if you’re going to do it, this one will definitely win you plenty of brownie points! For a simple yet delicious recipe, try these delicious Eggs Benedict. We love Jamie Oliver, I mean who doesn’t? This recipe is, according to himself “super easy” so don’t worry, if you’re not a whizz in the kitchen you don’t need to be! Add bacon egg and maple syrup, or something far healthier if that’s what your loved one would prefer, and you will be in the good books for the day! Of course no ‘top 5 breakfast in bed’ list could ever be complete without the full Irish! For most of us, this is a rare treat and something we indulge in rarely, as a naughty indulgence. But what’s great about this option (apart from the fact that it always tastes soooo good!) is that it’s simple to cook: even those of us who are not, let’s just say, of the Masterchef calibre can cook a quite delicious full Irish!. So, why not push the boat out this Valentine’s Day and go for this wonderful Jamie Oliver version of this age old classic. 4. 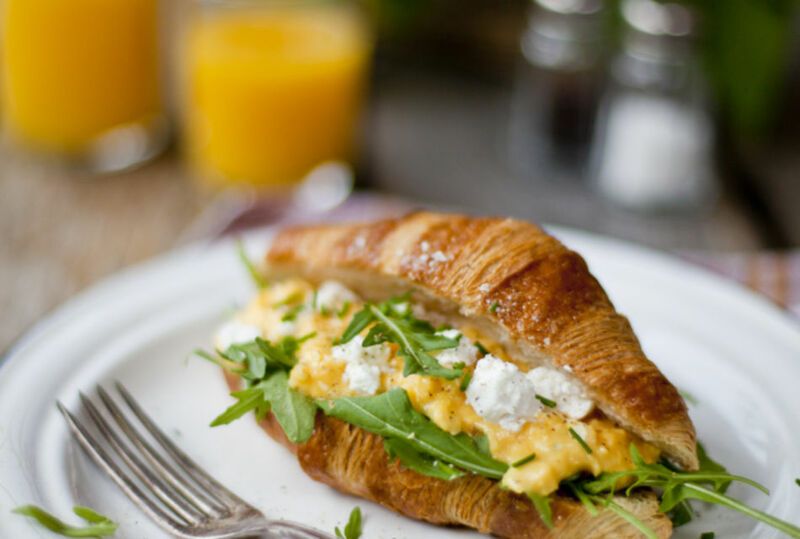 Scrambled eggs with goats cheese and rocket….all inside a fresh croissant! When it comes to creating a simple breakfast classic, you simply cannot beat scrambled eggs, not only because they taste great but because they’re easy-peasy to make too! But though scrambled eggs in even their most simple form are delightful, how about going trying this ultra-fancy version of this old favourite, a la Donal Skehan, to really make this a breakfast in bed to savour? Yes, making a luxurious and out of the ordinary breakfast really is that simple and will literally ensure you are flavour of the month….for at least a full day! There’s just one word needed to sum this one up: Delish! When it comes to wanting something indulgent rather than healthy and nutritious, you simply can’t beat the American style breakfast that is a plate of pancakes. This particular recipe is simply ‘immense’, and is as much an experience as it is a breakfast! Again, the beauty is in the simplicity. Make some pancake mix (milk, flour, and eggs all whisked together in a bowl, couldn’t be simpler! ), and whilst ladling this onto a hot pan, add a few slices of banana onto the surface of each pancake as it cooks. Then, once the pancakes are cooked, add the hot crispy bacon, drizzle lots of wonderful golden maple syrup over the lot and hey presto, your partner will be eating out of your hand (once he / she has polished off the plate of pancakes that is). White’s award winning Jumbo Organic Oats are hearty and delicious oat flakes which have been naturally steamed and rolled for a supremely creamy taste and rich texture.